Striker Danny Ings insists he’s going nowhere with the transfer window about to open. The England Under 21 international has attracted a host of speculation about his future, with his contract up in the summer. 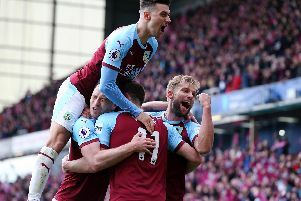 But the former Bournemouth man, who has netted four Premier League goals so far this season, is merely focused on helping the Clarets stave off the drop back to the Championship. Asked if he wanted to stay and try to keep Burnley up, he said: “That was the plan. “I’m contracted until the end of the season and that’s the way it’s going to be. He admits the rumours - with the likes of Ajax, Newcastle, Everton, Sunderland, Werder Bremen and David Moyes’ Real Sociedad all linked with a move - are flattering, but haven’t turned his head: “Especially for a young lad, it’s quite easy to lose concentration for some people. “But I’m not that sort of character.